The Holiday Inn Express Hotel & Suites Pine Bluff is the newest hotel in Pine Bluff. We are a three story interior corridor hotel conveniently located in a safe area. Guest room amenities include: coffeemakers, hair dryers, irons and ironing boards, two telephone lines with data-ports, microwaves, refrigerators and pay per view movies. Hotel features include free local phone calls and a complimentary Express Start continental breakfast. Enjoy a unique breakfast experience at our new Express Start Breakfast Bar served every morning featuring a selection of fruits, juices, cereals, breads/pastries, and even hardboiled eggs. We have also created the world's best tasting cinnamon roll. 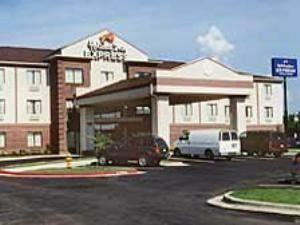 Visit Pine Bluff, AR and stay smart at the Holiday Inn Express Hotel.